Erasmus of Rotterdam (c. 1466-1536) is one of the greatest figures of the Renaissance humanist movement, which abandoned medieval pieties in favour of a rich new vision of the individual's potential. 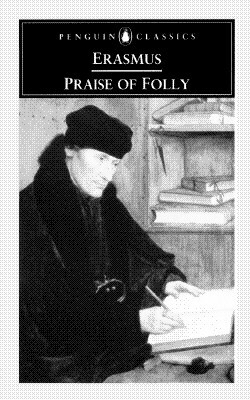 Praise of Folly, written to amuse his friend Sir Thomas More, is Erasmus's best-known work. Its dazzling mixture of fantasy and satire is narrated by a personification of Folly, dressed as a jester, who celebrates youth, pleasure, drunkenness and sexual desire, and goes on to lambast human pretensions, foibles and frailties, to mock theologians and monks and to praise the 'folly' of simple Christian piety. Erasmus's wit, wordplay and wisdom made the book an instant success, but it also attracted what may have been sales-boosting criticism. The Letter to Maarten van Dorp, which is a defence of his ideas and methods, is also included. Desiderius Erasmus, (born October 27, 1469, Rotterdam, Holland—died July 12, 1536, Basel, Switzerland) was the greatest scholar of the northern Renaissance, the first editor of the New Testament, and an important figure in classical literature. He helped lay the groundwork for the historical-critical study of the past, and his educational writings contributed to the replacement of the older scholastic curriculum by the new humanist emphasis on the classics. By criticizing ecclesiastical abuses, he encouraged the growing urge for reform, and his independent stance in an age of fierce controversy made him a target of suspicion for loyal partisans on both sides and a beacon for those who valued liberty over orthodoxy. Betty Radice read classics at Oxford, and became joint editor of Penguin Classics in 1964. As well as editing the translation of Livy’s The War with Hannibal she translated Livy’s Rome and Italy, Pliny’s Letters, The Letters of Abelard and Heloise and Erasmus’s Praise of Folly, and also wrote the introduction to Horace’s Complete Odes and Epodes, all for Penguin Classics. She also edited Edward Gibbon’s Memoirs of My Life for the Penguin English Library, and edited and annotated her translation of the younger Pliny’s works for the Loeb Library of Classics and translated from Renaissance Latin, Greek and Italian for the Officina Bodoni of Verona. She collaborated as a translator in the Collected Works of Erasmus, and was the author of the Penguin Reference Book Who’s Who in the Ancient World. Betty Radice was an honorary fellow of St Hilda’s College, Oxford, and a vice-president of the Classical Association. She died in 1985.